129 Philip Owen Ayton . 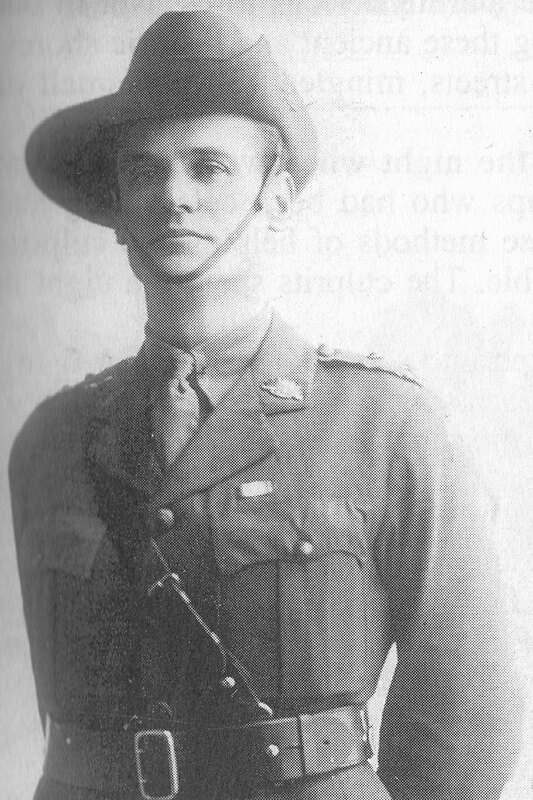 129 Philip Owen Ayton was born on 26th April 1889 in Eltham near Melbourne Victoria. His father was Joseph Ayton an orchidist, and mother Nina (Minnie) Celeste Kelly. The Ayton property was known as “Dingley Dell“and was one of the earliest holdings under orchard in the Warrandyte area. Philip was a locomotive driver when he enlisted at the age of 25, and his younger brother Walter Ayton enlisted six months later and joined the 22nd Battalion A company. Walter later transferred to the 1st FCE in France, and the two brothers were together in the same company on the western front in 1917. 213 Roy Denning’s diary described Philip as outspoken and full of bravado,“he was a real soldier, as game as a bull ant ” willing to do whatever was necessary, “a man who bolstered the morale of men around him”. Roy Denning, Talbot Griggs and Phil would become good friends and shared a dugout at Gallipoli until Phil was wounded in the leg by shrapnel. They would however reunite forces on a number of occasions throughout the course of the war. 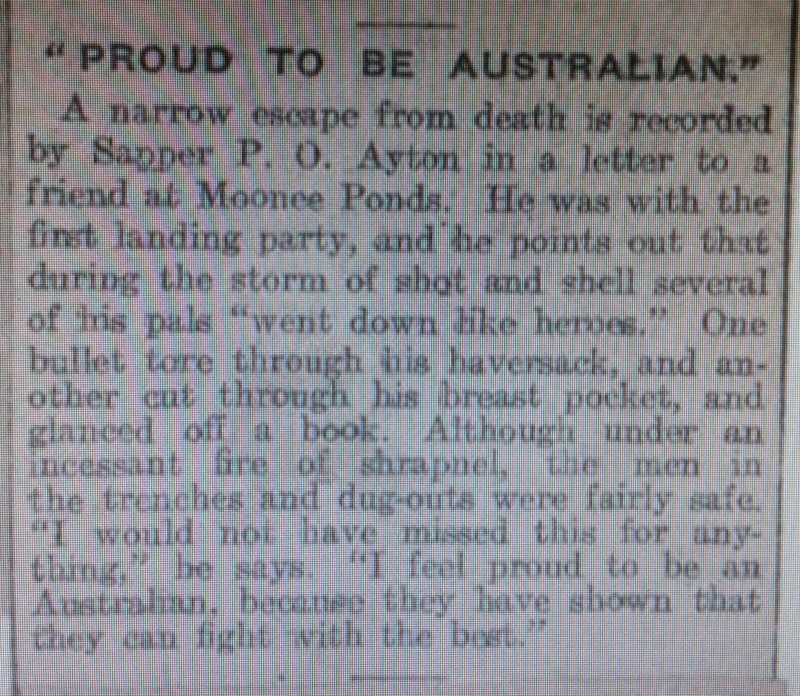 The following is a news article relating to Phil’s account of the landing day at Gallipoli. The letters from Phil were published in the principal newspapers in 1915 before military censorship stopped further publications. Late in July he was hospitalized with an undiagnosed illness which turned out to be appendicitis . He was then transferred to hospital in England in October 1915. 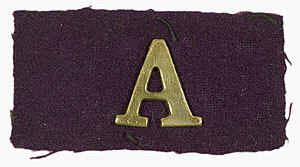 He returned to the unit and disembarked at Marseilles 28th March 1916 in preparation for the front lines. Phil had been promoted while in the field in France and then perm. Corp Vice to his good mate Roy Denning. In August 1916 at Poziers the scene of the heaviest and longest run of artillery bombardments the allied forces had seen, it would be Phil Ayton who would come to the rescue of Roy Denning. This is exactly what occurred when Phil and Roy and a party of officers and engineers were preparing to start a new trench,….. a deafening, blinding flash and a massive explosion ripped the earth apart killing an officer and completely burying Roy Denning. At once his old mate Phil Ayton dug him out from his suffocating tomb. Sadly Roy would be tormented by this incident for the rest of his life. On the 25 and 26 February 1917 there was much Australian action around the Butte de Warlencourt. This was yet another occasion when Phil Ayton showed how robust an individual he really was. The Short Account of the 1st FCE also describes the 25th February 1917 and the events of the day in the same area as the most disastrous the company had experienced during the entire war. The citation describes that a party of engineers were at work on a communications trench at the nearest position on the front line at Le Barque. Phil under extremely heavy bombardment and close range machine gun fire , in the open on a number occasions and placing himself at great risk whilst continually surrounded by shelling he managed to get every member of his party, one man at a time out of range of the surrounding bombardment until each man was safely undercover. Phil later served in the 4th officers cadet school from Nov 17 till May 1918 and eventually became a commissioned officer with rank of Lieut. and he would see little action after this, and by November the war was over. Perhaps just in time as it seems Phil was gearing up for possibly more adventure. Phillip returned to Australia on the ‘Orca’on 3rd April 1919 and shortly after in 1919 he married Eliza Ellen Jessie Clarke in Glebe Sydney . They both returned to his father’s farm at Warrandyte, Victoria along with his brother Walter and their sister Ivy. In 1920 they had their first child, a son Philip born in Hawthorn Victoria. In 1924 Phil and Ellen had moved on and were living at Murrumbeena and he became a butcher and was a member of the Smithfield Masonic Lodge. Phil and Ellen would have another son Owen Roy Ayton and two daughters Nora and Dulcie. Both sons would later enlist in the Australian Armed Forces. 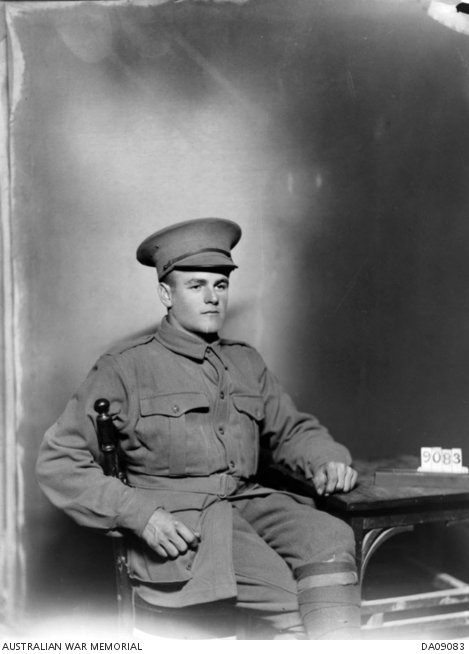 Philip Ayton died suddenly at his home on the 1st October 1946 in Carnegie Victoria aged 57. He died in 1941 in Banghazi, Banghazi, Libyan Arab Jamahiriya, at the age of 44, and was buried in Libyan Arab Jamahiriya. Walter’s war grave in Lybia was desecrated – see news articles link below. Daughter – Nora, married Fuller ? NLA – Letters from Gallipoli, 1915 [manuscript] : published in the principal newspapers in 1915 before military censorship stopped further publications.